OctFest, which unfolded this past weekend in New York City, touted itself as "a one-of-a-kind beer, music and food festival." In addition to the sounds of Vince Staples (big with the kids), Jeff Tweedy (big with the non-kids), Yo La Tengo (best band ever) and The Flaming Lips (do you realize they've played every festival ever?? ), 86 breweries and cider companies poured their goods across two days on Governors Island, just off the southern tip of Manhattan. While perusing that list of 86 breweries and cider companies, something kept nagging at me: a lot of them seemed to be affiliated with Anheuser-Busch InBev. That unto itself was no surprise. OctFest was "presented by" Pitchfork ("the most trusted voice in music") and October ("a leading beer culture website"). But as has been made clear here before, where Pitchfork and October are involved, the interests of Anheuser-Busch usually follow close behind. So I wondered: to what degree was OctFest an Anheuser-Busch InBev marketing vehicle? 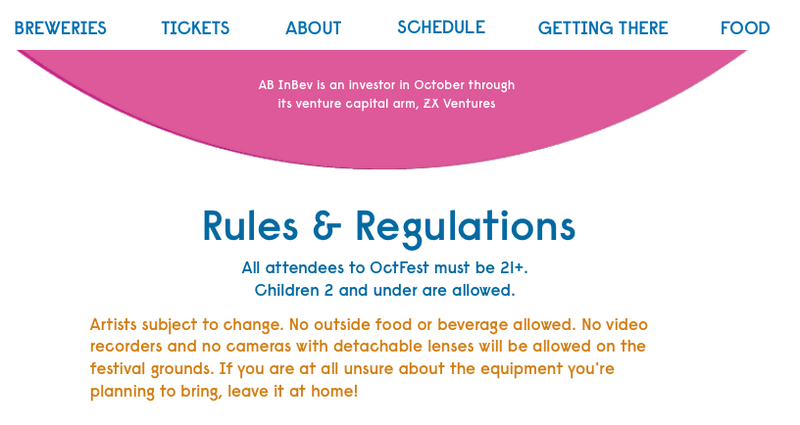 By funneling OctFest through October, few are able to discern Anheuser-Busch InBev's role in the event. Most media was sucked into the desired narrative, including the venerable The New York Times: "For the second year in a row, the music website Pitchfork and its spinoff 'beer culture' site October are hosting a festival that combines their areas of expertise ..."
Final tally: Anheuser-Busch InBev has a stake in 35 of the 86 breweries and cider makers that poured at OctFest — 41 percent. That included whole ownership of 33 of them. So, yes. OctFest was very much Anheuser-Busch InBev's party. In addition to transparency, another common gripe from Anheuser-Busch InBev skeptics is that the company's forceful move into craft beer creates an "illusion of choice"; by snatching up so many breweries, then continuing to trade on them as the same brands they were before their acquisitions (which, granted, is the point of buying them), the world's largest beer company is clouding a consumer's ability to differentiate between small and local businesses and the breweries that funnel back to billionaires. For instance, how was anyone at OctFest supposed to know that Cerveza Cucapa was owned by Anheuser-Busch InBev, but Cerveza Urbana was not? The guess here is that they weren't supposed to know that at all. [i] Bira reached out to Anheuser-Busch InBev for financing in 2016. So the actual state of that relationship is anyone’s guess. [ii] Cisco Brewing is involved in a “strategic partnership” with the Craft Brew Alliance, which is 36 percent owned by Anheuser-Busch, and which Annheuser-Busch has an option to buy in the coming year. [iii] Kona is owned by the Craft Brewers Alliance, which is 36 percent owned by Anheuser-Busch. It is also an important brand across the Anheuser-Busch distribution network.